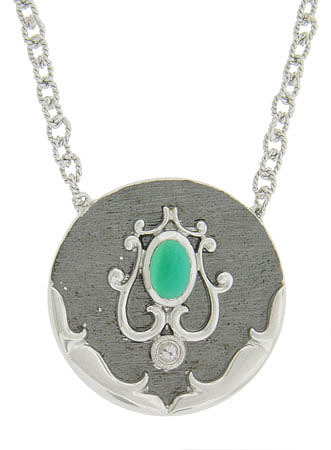 This handsome sterling silver pendant and attached necklace is set with an oval green onyx and round cut faceted white sapphire. Brightly polished curling filigree and wide organic figures adorn the medallion, while the surface of the circular pendant has a darkened finish. The attached chain features twisted rope links and measures 14" in length. The pendant is 3/4" in diameter.